buffygirl wrote: I think that is the most beautiful thing I've ever heard ... I mean read. I still say it is Heresy. Well-written heresy maybe, but heresy none-the-less. Wait, you mean it was supposed to read "Needle-pulled-think"??? chem1190c wrote: On that subject, did anyone ever find the actual first frame? I know there was quite a bit of discussion back at the dawn of Time about how frame 0 was/is missing. Naturally it wouldn't have occurred to anyone to bother saving the link until after the first newpix appeared by which time it was too late to save. for the first frame. Don't know if someone uploaded the real first frame to there or not. Yes it is just crap I re wrote from the first few forum posts on time. It would seem there are too many different groups of different belief to ever write anything that is not heresy in this world. Awwwww *pats him gently on the shoulder,* it's ok. 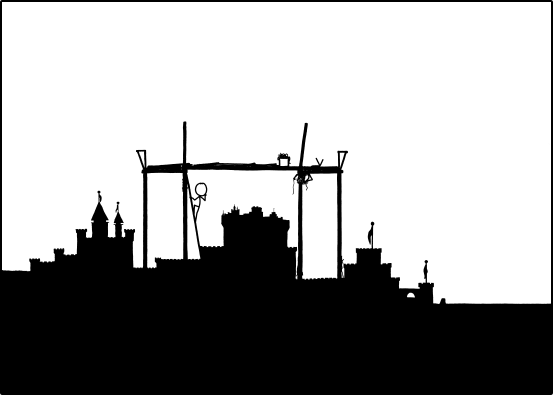 Isn't it probably true that after they decided they can't build the castle much higher, they got an idea and decided to build it up on scaffolding? So first they built the scaffolding, then they made it strong enough, then maybe next they're going to move the castle, or just build another one, to the top of the scaffolding to protect it from the rising sea? By the way, I'm posting this from the past, from a few pages back. I now go back to catch up. Last edited by Tatiana on Fri Apr 12, 2013 1:46 am UTC, edited 1 time in total. I guess I'm the lone voice in the wilderness. But then I'm still of the belief that Newpix and Timeframes are the same thing. Are those little tiny cranes she's mounting at the corners? On page 289 Whizbang wrote: I predict at least one Crane Kick stance. I, Eternal Density, being of noisy mind and live body, hereby dub my future self as Temporal Rook of Eternal Sandwiches and Dense Ham and Cheese. I just went back to the first thread and checked the first [hash].png file they found which was definatly newpix 2 based on when it was posted. 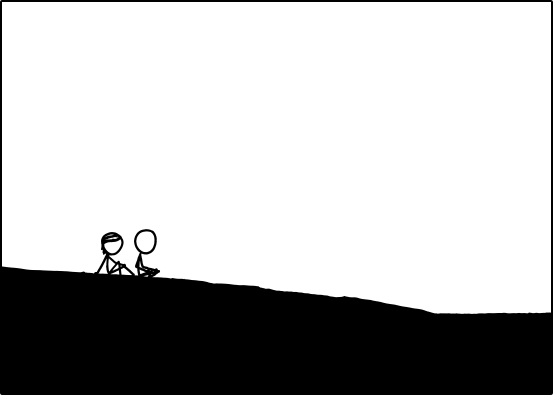 The time.png in the expainxkcd wiki looks to be the original first image as it is different than all the recorded [hash].png newpix from later. So someone must have captured it which would be easy enough from someone local web cache and uploaded it there. Eternal Density wrote: I, Eternal Density, being of noisy mind and live body, hereby dub my future self as Temporal Rook of Eternal Sandwiches and Dense Ham and Cheese. Naming ourselves after birds, are we? Why not go with Time Vulture? She dropped the Allen wrench. Edit: Thank you, Valarya, but according to the official forum rules red text is forbidden. Last edited by SBN on Fri Apr 12, 2013 2:05 am UTC, edited 1 time in total. PhoenixRising wrote: As far as I know, nope, the true first frame is gone forever. So, in the holy book sent to Randall shall it be a blank "do it yourself" page? I, Knighty Knight, go to coma, as is my wont. No, I meant the chess sort of rook. Any Timewatchers or Initiates of Time out there? Newpix be the first name given by the followers for the gift bestowed upon us by the Creator, and as such, is inferior. TimeFrames be the second name, and it being a better play on words, it is also inferior. The name given the Newpix by the creator is long (256 hex digits) and complicated and impossible to remember, and as such the proper name that should be used. DoOd! WTF? Where do you come up with this $#!+ ? Calm down! No one's going to crucify1 anyone's son, Ok? 1 Trebuchet maybe, but no crucifixions. That framing is starting to look like a castle. Last edited by edo on Tue Apr 16, 2013 10:58 pm UTC, edited 2 times in total. I was under the impression that a Newpix was an old unit of time equivalent to one outsider half hour, and as a corollary to that, a longpix is an outsider hour, whereas a Timeframe is the period of time between new pictures regardless of outsider time. So - balloons? Flying fish? Sandcastle of Babel? Pterodactyls? What should we expect there...? Buffygirl - awesome hat you should post it for posterity (and thanks for letting me keep my helmet, being trebucheted wouldn't be safe without it. Nüpiks occurs upon the Update of the One True Comic; Löŋpiks occurs when the Update occurs once every Outsider hour. A Timefräme is the time betweën each Ancesträl D/B/Göŋ; the ancestral D/B/Göŋ occurs just moments before the Update, and is such that one can view the Update in all its glory. tman2nd wrote: I, Tman2nd, hereby join The Order of the Temporal Knights and swear to protect The One True Comic from all threats, Outside and Inside. And that, kids, is how you know this is a real religion. Latent22 wrote: It would seem there are too many different groups of different belief to ever write anything that is not heresy in this world. That's okay. The important thing is that you're on good terms with people of all faiths. Crows do. They're scary smart. We, the Initiates of Time, are unsettled in place, wandering the Timeframes between the Newpix which doth mark at once their ending and their beginning, a Newpix being the ending of a Timeframe and at once the beginning of a Timeframe. Thus are the Timeframes marked, only by the Newpix. The coming forth of the Newpix is ordained, by The Great Lord Randall, but he doth not grace us with the knowledge of precisely when they will arrive. Great predictions hath been made, and been shown to be False. We allow others to form their religions, accepting their need for such (and enjoying such treats as they may distribute according to their beliefs, but only our gratitude can we return.) Our creed is simple, and ordained by The Great Lord Randall: Wait for it. partingLance wrote: ...has anyone else here seen The Land That Time Forgot? The 1975 theatrical version, I mean. I'm sure I liked it at the time and am almost equally sure I'd find it laughable trash -- or worse yet, dull trash -- now. The poster, though, has a curiously 1950s look, which holds out some mind of promise for the better class of trash. I've seen it, and actually, it's not a bad Saturday-matinee monster flick. And (if I may be forgiven for allowing the Outside to intrude) it's on Turner Classic Movies tomorrow (Friday 04/12) at 06:15pm Eastern. He's right about the movie poster (being a good boy and not hotlinking it). Last edited by jjjdavidson on Fri Apr 12, 2013 11:45 am UTC, edited 1 time in total. jjjdavidson wrote: Anybody remember this? Well, technically, the author, being Russian, could only have his name spelled correctly using Cyrillic characters; anything using Latin letters is an approximation. I don't know all of them, but I heard once that there are 13 different accepted ways of spelling Tchaikovsky. Not including it as an [img] doesn't mean it won't be a problem; it still comes up forbidden on account of referer [sic]. Sometimes the only thing for it is to link to the page containing the image. Added: And for Randall's sake, don't link to the mobile version of IMDB in the forum. Last edited by jjjdavidson on Fri Apr 12, 2013 11:44 am UTC, edited 1 time in total. Sure. I mean, my sister does. Can I be a Greek Omelette with fries and a tomato juice; hold the toast? elementropy wrote: Can I be a Greek Omelette with fries and a tomato juice; hold the toast? Seriously. Is it Time for Breakfast? I hope you are doing well in your quest; we are cheering you on with more and more excitement as you get closer to catching the fast train we're riding into the future! BEAUTIFUL job on the poem, too! The Now, and newpages long since made. Meant I would not be long delayed. So back into the past I went. And discussions of religious bent. Both Times that day appeared as just. I chose the posts that had amassed. Although by then it would be Past. the more I learn of it, the less I know it. Time traveler, inspiration, and poet!" Last edited by elementropy on Tue Apr 16, 2013 12:43 pm UTC, edited 3 times in total. Last edited by rainycity1 on Fri Apr 12, 2013 6:42 am UTC, edited 1 time in total.